Tyre - Ancient Phoenician city on the east coast of the Mediterranean Sea. 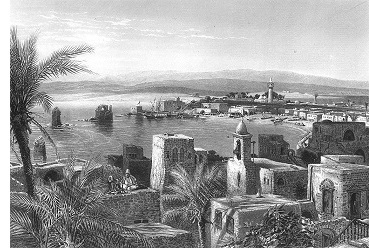 Along with Tyre, the Phoenicians built several coastal cities, such as Sidon and Byblos, which became powerful commercial centers. The Phoenicians were seafarers who traded in just about every commodity known at the time. Tyre was besieged by both King Nebuchadnezzar and Alexander the Great. Nebuchadnezzar conducted a 13-year siege, from 586 to 573 B.C., that destroyed the mainland quarter. It took Alexander only six months, in 332 B.C., to destroy the island quarter a half mile off the coast.